Due to the complex nature of medical mission trips, we have provided extensive information based on current medical and mission organizations’ standards and years of experience in the field. We recommend that you read the Medical Mission Guidelines thoroughly. This guide will provide you necessary information regarding our clinic, formulary and protocols. Please contact our Medical Team Coordinator at medtrips@haitioutreachministries.org to get current information regarding the clinic operations and to help plan your medical mission. Even if you have been on a medical team before, we ask that you review the materials as we update this information periodically to reflect changes. Often a diagnosis may be determined based on history, but bear in mind that common symptoms may have very different etiologies in Haiti versus North America. We encourage all provider to familiarize themselves with the appropriate treatment protocols for working with this population. Several resources regarding treatment of tropical diseases, including STD algorithms and dermatological conditions (with photos) are available below. 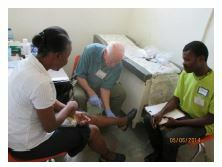 The following resources, protocols and guidelines are designed to help our health care professionals provide optimal care to our patients in Haiti.